You must reserve your area now. 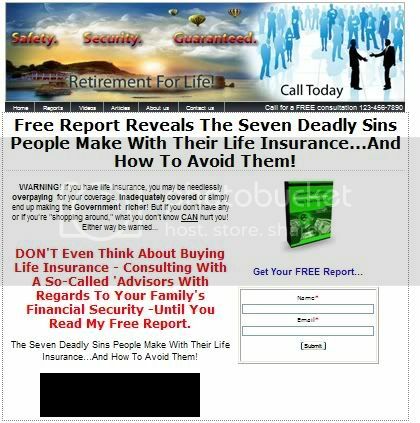 "Discover the turn-key system to stop cold calling forever and attract hot, qualified insurance leads to call you"
We also have seasoned annuity, life insurance and final expense internet leads for only $7.00 to $0.75 per lead based on quantity ordered. Discover How to make $250,000+ a year in income using our "7 Step Turn-Key Postcard and Internet Lead Marketing System." Finally a Proven, CUT and Paste, Internet Marketing System and our "3-Step Postcard" DRIPPING CAMPAIGN to FLOOD you with the Predictable Floods of exclusive high quality Life Insurance and Annuity appointments for the rest of our life...Without Making One Cold Call. "With the TOTALLY done for you "Instant Client Attraction System", we take care of you from start to finish." Believe It Or Not, You Can Quickly And Easily Double Your New Clients in 90 Days Or Less, Without Hiring Additional Staff, Spending Long Hours Creating Marketing pieces, Or Even Having To Increase Your Overhead...Guaranteed! Announcing A Marketing System That Virtually Eliminates Your Competition, Gives You Breakthrough Results With Almost Every Campaign, And Is 97% Automated. "NEW BONUS JUST ADDED" We have access to seasoned annuity leads, insurance leads and final expense leads in your state. The cost for insurance leads are only $2.50 per lead and you can also purchase internet annuity leads for $10.00 per lead. We contracted with a major internet lead wholesale to buy 5,000 per month. Call RJ at 435-563-4749 for more details. I have calls all the time from prospective members who are always in need of leads and they hate the thought of cold calling. I feel their pain, anxiety and fear of not making a living for their family. 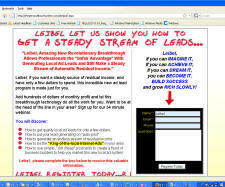 In this letter I'm going to show you how to attract quality leads and live the lifesytle you want and deserve. 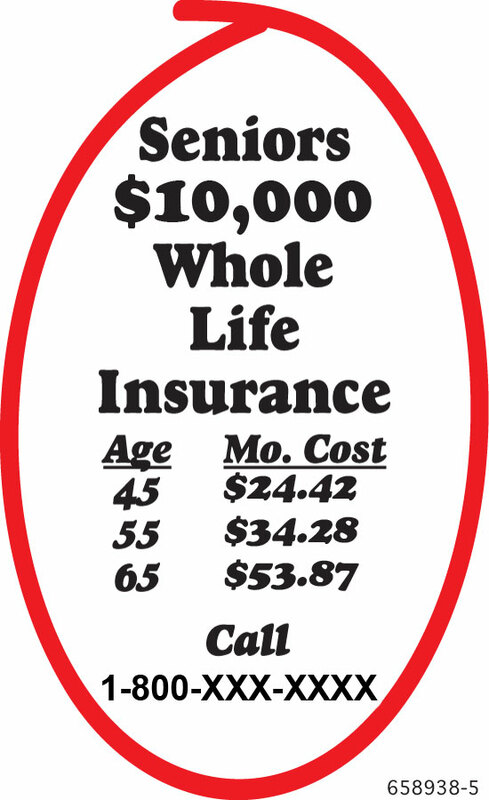 Imagine for a moment that you are able to attract life Insurance and annuity prospects searching the Internet for an annuity in your target area. And when they get to your web site you magnetically pull them (like bees to honey) into a totally automated marketing system. And then that pre-recorded system automatically does all your follow-up with them as you were typing the message to them yourself...until they call you to get an appointment to get together. In addition, this can be accomplished without licking stamps, paying any costly staff or assistants and even while you sleep or spend the time with your family and friends. Well, it has become a reality now for those agents who want to take their practice to the next level. Learn How To Use The Best Kept Secret In All Of Marketing To Explode Your Profits Instantly and Automatically! Discover The Revolutionary New Automatic Profit Marketing dripping campaign system that AUTOMATICALLY Gets More Clients, Whether You're Working or Not! Repeatedly keeping your name on a Prospect’s radar is imperative to building a relationship that helps prospects mature into a Clients. We have created multi-piece prospecting campaigns just for that purpose. A pre-crafted series of letter, reports, emails and newsletters you send to prospects and clients, one by one, over a period of time, to keep your name in their minds while gently nudging for a meeting. I'm talking about a step-by-step system you are 100% Guaranteed to Increase Your Sales. The entire system works on autopilot…you don’t even have to enter your name or contact info…it’s all completely done for you!! Best of all, it gets new prospects and clients calling you weekly on autopilot! "Imagine Getting a Consistent Flow of at Least 23-35 New Qualified Prospects Every 14 Days but Never Being Bothered With Marketing Ever Again! " My wife threatened me to get out and get a real job. Thanks to your advice; CD list I bought from you and your door approach last week I wrote three annuities for $166,000. Also, this week I've written three small annuities. Russ your not kidding when you told me to focus in on marketing and being positive is a winning combination. P.S. I've told two of my agent friend in another state about your marketing system. Anthony Huff Katy TX. "Clients who feel a connection with you are loyal and will stay with you--sometimes forever. Dissatisfied clients not only go elsewhere, but they also tell others of their dissatisfaction"
"How our Turn-Key Client Attraction System works"
When someone visits your site it is important for you to capture their name and contact information. Studies have shown that it takes an average of 6 or 7 contacts to convert a prospect into a client. In addition, you can type into the system all your prospects and clients and you will Discover how to get FAST MASSIVE results from you bi-monthly email letters. Our personalized emails sent monthly to your prospects and clients who you've entered an email address.Two email letters send monthly to your prospects monthly. We will be sending to prospects who have email address twice a month a letter and sometimes an article. < for month every on drip to use we CD’s and Funds Mutual bonds, IRA’s, (k), 401 own who investors wealth of list a compiled out gone have developers team Our>These Magic offer Templates-These templates are super easy, paint-by-numbers guide for creating magical offer web pages in one fell swoop. All you do is fill in the blanks. In fact, we have four web pages already been done for you. In the modern era you have to upgrade your marketing to meet the standards of today's information age. No longer can you afford to just send out plain old junk mail, you have to converse with your prospects on a one-to-one basis. Personally reach out to your prospects and deliver your message both in print and on the web. You need a website to sell to the baby boomers today. Once people call up your toll-free number looking for more information is very important to send out a steady follow-up campaign to these people. We will mail monthly for six months to your prospects a personalize letter and a 4-6 page report, and a referral card. The cost per mailing is $2.25. We will be sending them at least 6 or 7 letters with more information, trying to get them to set an appointment or make a purchase. These are your prime leads - don't waste them. There is no question...this is one of the most effective strategies used by top marketers (in every category) today. Discover the Gold Mine of sales opportunities hidden in your prospect and client files. We will mail monthly 4 page newsletter along with a personalized newsletter to all your clients and prospects. It has been our best referral tool we've ever developed. 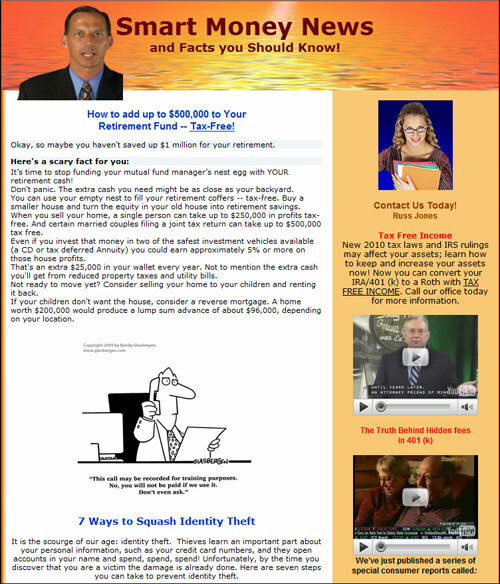 This 4 page "Stay -in-Touch" newsletter we call "The Smart Money Facts and News" will be available with our amazing affordable Internet Postal Mailing and Printing Service can put this on auto pilot for you. It's designed to help you stay in touch with your prospects, current clients, past clients and center of influences each month. Done properly, this can be one of the most effective "referral" strategies in your practice. Done improperly, and you've wasted the paper it was printed on. Toll free service is expensive, and to properly market your services you need a unique number for each of your mailings. We recognize this, and that is why we have teamed up with several toll-free service providers to bring you Free Toll Free Service. Phone Number & Caller ID Captured With Every Call. Free Transcription Service for all leads. Personal Postcard and Direct Mail Tear Sheets System #6. ( Value $129/Mo) Software system cost over $10,000 to develop. The biggest mistake agents make is not staying in touch with their contacts. This special website is driven by postcards to drive business to your webpage. 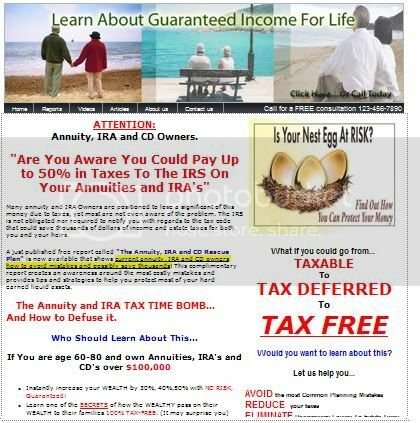 This page is really heavy into IRA Rollovers, annuities and retirement strategies. Even better...woven into each online newsletter is strategically placed copy that targets your prospects and clients "psychological hot button". I systematically incorporate techniques of "persuasion" from the "top experts" in the world. These techniques are so powerful (yet subtle), they will automatically feel compelled to respond to your newsletter by completing the online request form. "Discover How an Illinois Agent Made $277,578 in 6 Months Using the 21st Century Client Maximum System and spending ZERO on advertising." 3.Webpage for "Six Biggest Mistake Retires Make and How To Avoid" them includes postcards and script. 4. Annuity Pro Web page system includes postcards and script. I just wanted to send you a short thank you about your tax reduction program. Out of the one thousand piece mailer you sent out I got back 15 leads which were okay results. The good part though is that I made 8 appointments, and wrote two annuities for over $440,000 in premium. I would say those are some pretty good numbers for my first week using your program. Needless to say I am ecstatic and I will be ordering more leads every week because these leads are a great door opener and this program works! I have to admit, I did not develop this marketing model and yet yet it's the "foundation" that all of my marketing is based on. I believe that Dan Kennedy was the first person to develop this model, and it's used by the best marketers in the world. Here's the premise: To grow your practice (or any business for that matter) every month (with any consistency), you need to focus on 3 primary areas that drive the practice. 3) reactivating the "herd" (recalling and getting prospects and clients to buy more). You may think since this System offers all the above benefits and integrates 3 proven marketing strategies that it would cost a bundle. Your wrong! You can start for only $49.00 a month. Get Our Brand New FREE "Insurance Marketing Department in a Box Money Machine"...And earn $5,000 to $15,000+ in IRA Rollovers and annuities for each client this "Machine" finds for you! "Your Insurance Marketing Department In A Box"
I have just released a confidential new "2011 Insurance Marketing Department In A Box System ." The "Ultimate Internet Advantage:" A small, 1-column x 2-inch newspaper ad that is so irresistible and so compelling, that roughly 80% of all prospective clients in your marketplace will make it a point to visit your website or call your office...before they make a decision as to which advisor they may want to use. How to use the incredible strategy of sequential mailing - that once unleashed in your business will cause you profits to explode like the fourth of July fireworks display! You will have access to "World Class Marketing Strategies" so compelling you will have prospects salivating for what you sell like a pit bull for a t-bone steak. The most unique business card on the planet. How to convert your business card into a "marketing weapon" that actually compels people to call, book an appointment and refer like crazy. How to target market niche marketing prospects with irresistible, highly compelling personalized touch postcards (printed and mailed) for you. "Poor Boy" Marketing Strategies: How to jump-start your business with little-known, low-cost, powerful strategies that will have your phone ringing off the hook. If you can follow simple “Grade School” paint-by-the-numbers steps you can get rich slowly as a local “Retirement Specialist” in the IRA Rollover business. You will learn how to quickly win the respect and trust of powerful people. A powerful stealth marketing strategy that pre-qualifies your prospects, educates them, sets their buying criteria and makes you the only logical service provider in your market! A classy system for staying in touch with your prospects and clients throughout the year that, alone, will double your profits within the next 12 months. I've done this for years...Always give a “Transaction Initiation Gift” and You’ll be amazed at Your Client Loyalty, Referrals and Word of Mouth Representation. If your average commission is $5300 then you should be able to afford $20.00 a client to bring a steady flow of leads. I have a member in California has the ability to milk this secret weapon for millions of dollars in annuity premium. That's just a small sample of what you'll find in the 155 page information rich "Your Insurance Marketing Department In A Box" System. 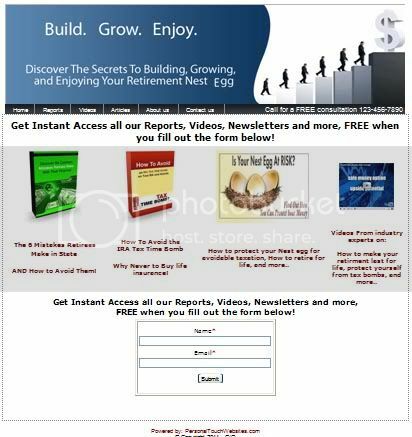 It gives you the exact roadmap and strategies you need to follow to become a top producer in our industry. It's important to note that this manual is PACKED full with information. There is not one ounce of fluff or filler it is all meat. 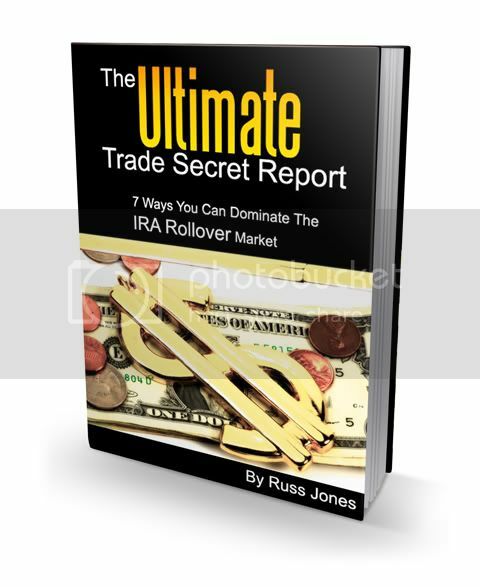 Here's some of the marketing strategies you will learn in the "Ultimate Trade Secret Report." You will receive our digital download monthly Million $$$ Producers Report and bonuses. This report will be from 6-12 pages long and will include all the marketing and sales strategies you need to dominate your market place over the next 12 months. The normal monthly charge for these reports is only $27.00 a month, but we're including it free wioth our "Instant Client Attraction System." Here's just a brief sample of the marketing strategies you will learn. How to ride the crest of this tidal wave and become a million dollar producer by specializing in 401 (k) and IRA Rollovers and jumbo annuities. 10 Biggest Mistakes Agents Make in Marketing and how to avoid them. You will discover the scientifically tested marketing pieces and sales strategies you MUST HAVE in your rollover arsenal tool kit. Can you imagine having a treasure trove of marketing tools that attract IRA-rollover dollars like teenagers are attracted to a Hanna Montana rock concerts. 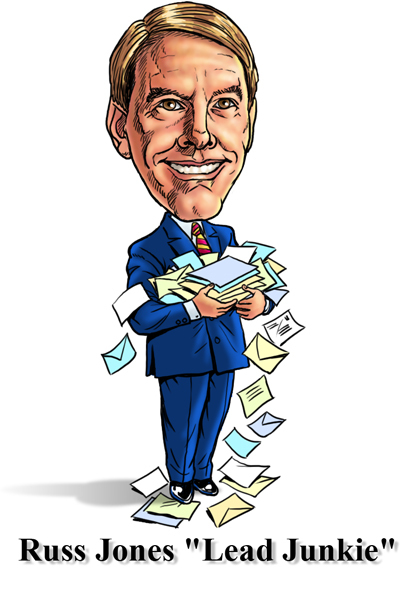 Every month you will receive an incredible collection of postcards, newspaper ads, marketing strategies and sales letters, (HR) Human Resource strategies that will give you a “UNFAIR ADVANTAGE” of the 18 million rollovers waiting to happen in the next few years! How to master the "three powerful head-turning HOOK power phrases" that will reel in your prospects like crazy. (This concept alone with take you out of being a sales person and gain instant trust and will make you their trusted family financial advisor. How to build a steady flow of income through annual review updates and how to keep this river of revenue pouring into your bank account, like a perpetually flooding of the Mississippi River. 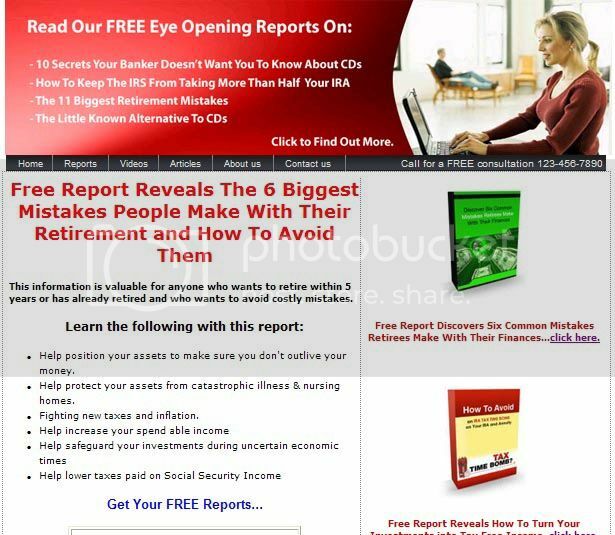 FREE BONUS REPORT#3 “How To Make $85,000 Annually in the Senior Life Market.” Generating 2-3 Daytime Appointments Will Be a Cakewalk! This is the system and presentation I used to generate over 1,937 life insurance policies over a 12 year period. You will get the exact postcard I used that helped me write this business. FREE BONUS REPORT#4 A Quick-Start Guide that if your the type of Insurance agent who doesn't have the time to read and study all this material you can just start with this guide and be up and out on appointments within 7 days. FREE BONUS REPORT#6 A DYNAMITE Phone and Door Approach. You will receive my phone and warm door approach I used and documented my success over 4,000 times. The phone approach if you use it on a qualified niche list of CD, IRA and affluent widows will give you or an assistant who should be setting your appointments two appointments for every seven phone calls. I like to have an assistant set a 8:30 AM and a 11:30 AM appointment M-F. I'll pick up my own afternoon appointment myself. You will also receive my jaw-dropping warm door approach I developed and used that netted me a 40% appointment rate. Now the secret hear is the three magic words I use and seven power phrases. I built a whole agency around these two scripts and a half dozen other lead strategies. when I was full time in the field and not talking to 25-30 agents and members everyday I averaged 17 presentations a week. Of course, I come from the 'old school' where you work hard and you see people face-to-face when ever possible. I know this concept is not for many agents who don't want to work that hard. (How can you put a value on an approach that will help you get 2-3 presentations a day for just a few lousy bucks) Bonus #6 is for those agents on a shoestring budget.
" The Instant Client Attraction System"
Finally! The System you've been seeking for so long is here. You can stop leaving a fortune on the table forever! (If you really think about it; how much money, how many sales have you lost...Because you didn't automatically follow up with prospects and clients. This incredible instant client attraction system cost us thousands to develop by a top programmer and over 8 months of work. Create this totally automated, integrated marketing "machine" on your own. We had estimates of $20,000 to $40,000 upfront money and a monthly fee starting at $495.00 to $1200. Estimated time to develop is 11-12 months. Mark my words: This webpage your reading today may well prove to be a lifesaver for you. There are financial advisors that make 5 or even 10 times what you earn. Seven of the most incredible client attraction tools that will turn prospects into clients and clients who will continue to buy more financial services who will want to set appointments for annual reviews, write checks and refer their friends and associates to you. You will have access to our Turn-key client attraction system that will instantly send personalized letters, financial articles, email letters, pre-written monthly newsletter and monthly postcards. Our system has "Cracked the Code" on making staggering web profits by dripping on all your prospects and clients you enter in the system and who visit your website. We also set up holiday postcard mailings, prospecting campaigns, monthly newsletter campaigns or the occasional hand written note . Our automated mailing feature means no more signing, sealing, stamping and sorting. The system sends everything out, weekly and monthly automatically. It’s your virtual office assistant. Direct mail pieces are sorted, folded, stuffed, sealed, addressed, stamped and mailed first class for you. Our online CRM features allows you to upload your entire database of contacts information for both clients and prospects, making relationship building faster, simpler and more effective. How much farther would your practice be if you followed up with every person you’ve ever met with personalized letters, postcards and newsletters? That’s the idea behind our prospecting campaigns. Use them to convert casual acquaintances, good friends or people you meet into motivated clients. It costs about $80 to secure a good annuity lead. Spend another $8.00 per prospect and we'll send every prospect monthly for up to 6 months a cover letter/report and referral card, email letter and a monthly newsletter hard copy promoting you and the virtues of using you for financial services. For your clients we will send a monthly hard copy personalized letter and newsletter along with a strategically placed insert that offers additional information on IRA's, annuities and some times the benefits of the new Life Insurance. For your clients you type into the system (or we type them in) they will receive a monthly hard copy newsletter along with a referral card. All you do is enter the prospect's or clients contact info into your private, password protected database and we'll start the process of turning a prospect or client into clients who pay, stay and refer to you more business. You'll be amazed how easy it is to set an appointment with formerly complete strangers once they have received multiple correspondences. If you get leads or mine your own current client base, the trivial cost will create multiples of income. And there's virtually no work required on your part. Years of experience has taught us that if you send regular correspondences to your leads or current client base, they will buy more. It's that simple. When your prospects are finally ready to invest (when they sell a property, get an inheritance, life insurance proceeds, a CD comes due, etc), they think about their next financial move. And if you are sending them regular emails, newsletters and letters, you will be one of the first to get the call. Our turn-key Client Attraction System first and only automated "drip" system, which will send emails and letters to your prospect once every two weeks. Presenting our 20 correspondences, all ready to go. For every prospect you enter into the system we receive a email letter from you every two weeks. Next they will receive 6 special reports mailed out over 6 months. They will also a hard copy of our newsletter send monthly with a personalized cover lead from you. Every time we send out a letter on your behalf the prospect becomes more familiar with you. Every time your prospect gets any correspondence, they recognize you as their safest money expert. In addition, every letter, report and newsletter will have a referral card. Using our state-of-the art Red marker and personalization signature the prospect sees that you have signed every letter. Now at the bottom of this table you can view the actual article enclosed in every letter. Note that our system is able to highlight a portion of the article and provide a note as well, making it look like you personally attended to this letter. Finally, when your prospect is motivated to read about your free reports or view any of your enticing movie clips, they will be invited to your own personal web page promoting your expertise. This exciting web page provides access to all your movie clips and free reports advertised in your postcards, e-mails and letters. To get access to the movies and free reports, the prospect must provide their contact information on the web site information form . Once they do, you'll get an instant email informing you that one of your prospect's are viewing one of your free reports or movies. You'll know when their interest has peaked. And you'll know now is the best time to call. You can hire an assistant and pay them up to $50,000 per year, or you can hire us to handle all your follow up emails, letters, postcards, reports and monthly newsletters. Since our system is created to be simple and easy, and we have systemized it for your financial practice, all it takes is one new annuity client a year to pay for it… in fact, if you complete one extra annuity application a year because of our client attraction system, it could pay for the whole year of internal marketing. Limited to the first 100 agent who signup to test this service for 3 months we have discounted $420 off the setup fee of $497.00. Now only$77.00 setup fee and have dropped the enrollment fee from $597.00 per month to just $77.00 per month for the basic system. I am not repeating this introductory offer again – EVER! You have a rare, one-time opportunity to thrust yourself out of the frustrations most agents face right now and build a real business with lasting results. I promise this will be a life-changing decision for you...the best business-building system you can use for your career. All for a fraction of just one single commission. I hope you don't miss it. I am so convinced that our “Instant Client Attraction System” will help you increase your annuity and Insurance production that I am going to make you a no risk guarantee. You Do Not Risk A Penny At Any Time! Here is my GUARANTEE to you: Become a member today and use our "7-Step Turn-key Attraction System" on a monthly basis for the next 13 months and if you don’t increase your income by at least $12,000 using our Quick-Start-Guide instructions we will refund your money. If at anytime during the first 13 months I'm not completely head over heals, jumping up and down with joy, absolutely thrilled after using (keyword is "using") each aspect of my "3-Step Postcard System and Internet Marketing System," I can get a full refund of my monthly service. All we ask is that you try our system. This refund is very straightforward. No teeny tiny print. No notes needed. You Can See Everything For FREE…With This 13-Month No-Risk 100% Money-Back Guarantee. Please note Premium Membership is SOLD OUT at the present time. This price is ONLY temporary. If you return tomorrow the price may be back up. "Developer of the "Instant Client Attraction System"
P.S. You risk nothing, for less than a dinner out for your family you can have our "7-Step Client Attration System" per month. You can now stop cold calling and attract qualify leads for your business.